Although still a medium sized company of less than 100 employees the Uk based Andrew James Ltd. continues to punch above its weight as far as innovative products and commitment to excellence in business. Their catalogue boasts some of the best designed, most popular and very reasonably priced Kitchen ware found anywhere on or offline. Whilst other companies have continued to offer the bog standard Halogen Oven, Andrew James ‘ very well made basic product has been redesigned at least a couple of times, using advanced features, giving customers real improvements in an already excellent product. The first Halogen Oven from this company, available in the Uk around August 2009 was very competitive, of a standard 12 Litre size , very well manufactured and by including the spare halogen bulb and making sure it is easy to replace, the team at Andrew James attacked the Achilles heel of the device, its susceptibility to bulb failure, with vibration and age. Other manufacturers still have not learnt this lesson, so consequently, their customers end up with a useless unrepairable box and less of a reputation. Their model also stuck to the full specification of 1400 watts, I notice several other makes use smaller wattage bulbs, which diminish its overall performance in terms of time to cook, but also with a smaller range of temperature, they limit the recipes which call for the higher temperature. Andrew James show their faith in their products too, by offering a full two year guarantee, scanning through the Halogen Oven section on Amazon, I could find no other products with a guarantee to match. The second generation of Halogen cooker, which appeared around mid 2012 ,was physically similar but by incorporating a digital control panel, users could be precise in timer and heat settings. After all a recipe calling for X minutes and a temperature of Y degrees, needs to be repeatable, if you are to cook well. The digital controls also address the very annoying modern problem of the markings for the two dials on the older models, in that they wear off, very quickly, leaving you to guess where the correct settings are. I am glad to see the designer opted for the separate time and temperature displays. It really is a step backwards to see models with only one. A cook needs to see instantly, how much time is left and what the temperature is set to. Even the older dial type Halogen cooker shows these vital settings, at a glance. For anyone who has had to ring up about products they have purchased, the last thing anyone wants to hear is a foreign call centre. No matter how friendly and how well trained the staff, its just not the same as having calls answered by experts, in the same building as the products are sourced and dispatched from. Andrew James scores well with all its customers, in keeping its inquiry service on site , so full marks again . They are also making strides trading in Europe the right way, having French and German speaking staff on hand to answer queries. I am always reassured when reviewing kitchen gadgets like the Halogen Oven, when new models appear, which are an advance in technology or at the very least address the faults that manufacturers previous models had. The situation of the British Motor Industry in the 1970s comes to mind, with new cars rolling off the production lines with the same faults that the cars had ten years previously ! I found this recent feedback ( Sep 13) , referring to the JML Halogen Oven, which model was on sale way back, at least 2009 : I had to return 4 of these JML ovens. I have now got one from Alex James which is digital and it has lasted more than 6 months already. The heating section is black and well protected and does not discolour easily. You also get a free extra bulb (only company I have seen to do this)which you can fit easily yourself, and A 2 year warranty. I purchased this halogen oven around 2 years ago and within weeks the fan started to play up. Reason was the nut that held the fan blade on kept coming loose. After constant tightening of this nut it eventually kept coming loose every time I used it. This coupled with the fact the bulb did not last longer than a couple of months I gave in and purchased an Andrew James halogen oven – pure quality, in my opinion the best halogen oven you can buy. By keeping up with advances in technology, or incorporating useful methods from other existing products, Andrew James has beaten the competition out of sight, the leaders in any market know that it is only by adding value , will you be able to stay at the top. It doesn’t have to be innovative or clever either , I notice that the accessories offered with an Andrew James Halogen Oven are by far and away the best in number and in completeness. You aren’t going to be faced with a recipe calling for a pan , skewer or rack that isn’t provided straight out of the box. Another sign that the company is doing well is the number of medium and high end products offered, in the Ovens Cookers and Hobs section for example, I can see a Sous Vide cooker, Slow cookers, mini oven, Tagine, Halogen ovens in different sizes and colours, Digital Induction Hob and Electric Wok all of which look high quality and functional. 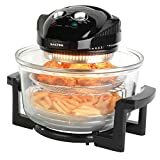 If you, like me have a family of chip lovers, consider purchasing a Air Fryer attachment for your Halogen oven. The Andrew James model for example, which is suitable for use with any 12 litre model. After trying it out, I can say there is no easier way to turn out perfect chips and with the minimum of effort. When cooking oven chips in a conventional oven, not only does it take nearly twice as long, but unless you are very careful and attentive, you end up with many ‘burnt offerings’. The Halogen in comparison, does the job a lot more evenly, due to the swirling hot air method of cooking. Just remove half way through, to give the attachment a good shake and quick stir round and you will end up with marvellous, low fat, delicious chips. If you prefer them a little crispier, just turn down the heat to 80% of the recommended heat( always read the instructions for your particular frozen chips ) for the last half of the time and cook for slightly longer. Can you pls. tell me if AJ halogen oven is compatible with Australian power rating standard of 230 Volts. What is the difference between the digital A J and the normal 12 ltr? Simply the settings which are set up using buttons for plus or minus temp and time. The power of both ovens should be the same so use with the same settings. Used the extender to cook Sunday roast – yummy ….. BUT CAN’T LOWER THE LID!! It seems to be totally stuck. Does anyone know if the fryer accessory can be purchased in the states if so where? i just bought a New halogen oven from Highlander company in Australia. It is a brand new and as i switch on the oven, the halogen light is not burning. is my oven a manufacturing defect? i would like know. Yes it sure sounds like it. Check for any signs of mishandling? Any marks or dents in the packaging ? Although not extremely robust, the halogen lamps usually stand up to normal postage handling ok. The FAN and the HALOGEN heater are the two main elements of a Halogen Oven. All the ones I’ve reviewed have at least these two things, some have rotisserie built in or some other feature, but the combination of Fan and Halogen is what makes this product so great for cooking. Please can someone tell me if I can cook frozen meals which need to be cooked from frozen in my Andrew James Halogen. Many thanks.